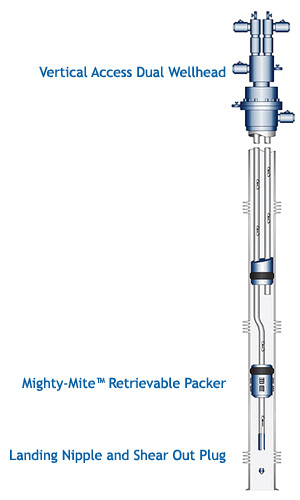 This type of completion equipment is most commonly used on single zone wells or multi-zone wells with no commingling restrictions. The simplistic design allows coiled tubing installations to be performed without the aid of a Select Energy service technician for greater cost saving. 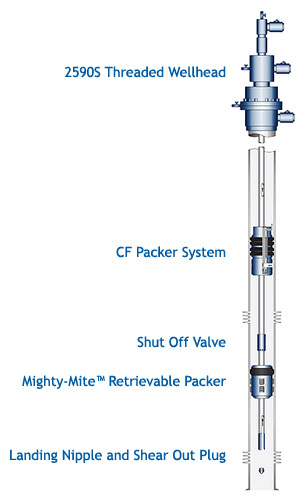 The integral installation thread configuration allows installation to API or ANSI casing valves without the need for crossovers or swadges while providing annular access ports for both flow and pressure monitoring. The resulting reduction of thread connections means reduced leak path points. The short stack height of this design is ideal in areas where interference with agricultural irrigation systems becomes an issue. 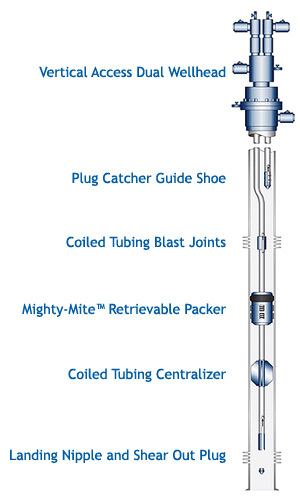 The versatile design allows for use in a wide range of tubing sizes. The ability to easily redress the threaded wellhead in the field offers the ultimate for cost, reliability, and function. Commonly used for production or injection wells, these completions are the simplest means to isolate the casing annulus and use either retrievable or permanent packers in mechanical, hydraulic, or e-line setting configurations. Single string completions can be tailored to use plugs, sliding sleeves, on/off connectors or other accessories to meet specific customer requirements. These types of completions are commonly used in applications where commingling of like zones is permitted. The tubing and the tubing/casing annulus are utilized for independent production from the separate zones. 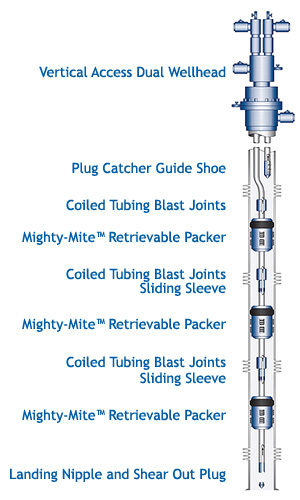 Similar to conventional single completions, these types of wells can be configured to use plugs, sliding sleeves, on/off connectors or other accessories to meet well-specific, customer requirements. The single string selective completion allows commingling, separate production, isolation, testing or stimulation of individual zones. This example shows a completion using Select Energy Systems packers and a sliding sleeve to control the flow from, or into, the zone by opening and closing the sleeve above the packer. 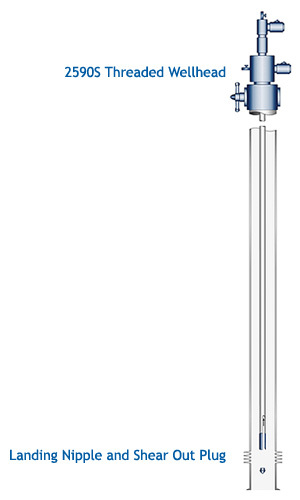 These types of completions are commonly used in applications where zonal crossflow is undesirable, or regulations prohibit commingling. 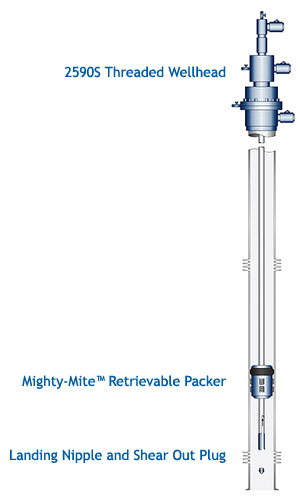 The lower zone is segregated by a packer and is flowed up the primary tubing string. The upper zone flows up the casing annulus or a secondary tubing string. Blast joint(s) may be run adjacent to the upper zone on the primary tubing string to prevent tubing erosion. Dual completions can be configured to meet a variety of customer well requirements. These types of completions are commonly used in applications where zonal crossflow is undesirable, or regulations prohibit commingling. By utilizing a dual packer configuration, the lower and middle zones flow up dual tubing strings and the uppermost zone flows up the annulus. Tri-zone completions can be tailored to meet a variety of customer well requirements. 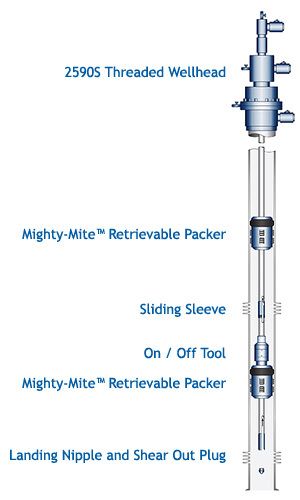 This completion design increases the well’s functionality by using sliding sleeves to independently produce, stimulate, test or isolate one or more zones, using slickline or other methods to manipulate the sleeves. The example at the right highlights a quad zone completion.